Today, Google is beefing up their security protocol with another method called Security Key. It is similar to a typical 2-step verification method but instead of manually typing a code that is sent via SMS, you'll have to use a compatible USB device to complete the verification process. 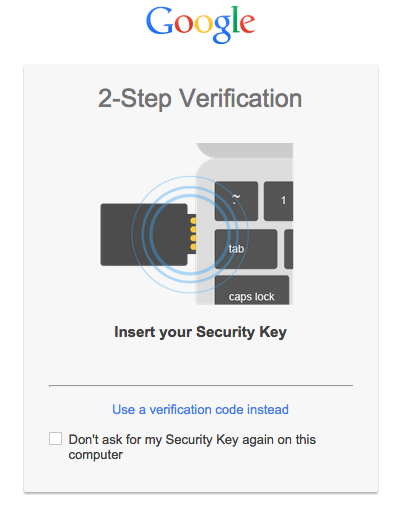 When you sign-in to your Google Account using a Chrome browser, just insert the Security Key USB device to your computer's USB port when prompted to finish the login as shown on the picture below. The security key uses Universal 2nd Factor (U2F) protocol from Fido Alliance. Other developers can also use the same protocol for their own login system for Chrome browser. The Security Key has no cost but you need to buy a compatible USB device directly from a U2F accredited vendor. To know more about this new way to secure your Google account, read here.